There’s a type of restaurant setup that’s very common in Paris – a much acclaimed hot spot develops high demand, and in an effort to relieve some of the pressure, a cool, more casual wine bar is opened next door, often sharing the kitchen. It’s something we actually wished happened more in this city. Imagine if Carbone had a casual wine bar attached to the restaurant where you could stand around drinking Sangiovese and eating finger pasta™? We’d be there all the time. 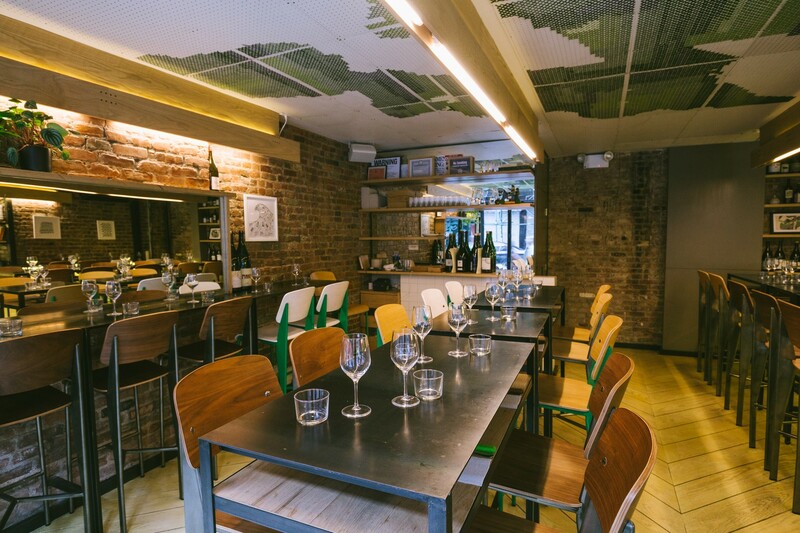 This seems to be the concept that led to Wildair, a casual wine bar owned and operated by the team who run the much-acclaimed tasting menu restaurant Contra, somewhat as an extension of the original restaurant. And while it is similar in many ways, it’s not quite the same as those Parisian wine bars. Wildair actually feels more like the main event, and Contra the extension. Why? Because while Contra is an exciting, special restaurant, Wildair is built for the way that the average New Yorker wants to eat most frequently: casually, with a friend or two, over some food to share. Ideally with wine. And excellent food. And great service. And somewhat reasonable prices. Yes, we New Yorkers have high, often unreasonable standards for our daily lives. That’s why you’re still single. Much like the last person you dated, we initially found that Wildair checked off all of the important boxes, but also had a few tiny flaws. The menu was inconsistent, often feeling a little too experimental. Sometimes we’d even come across a dish that was way too salty. But we’ve made return visits quite often since our initial review, and it turns out that, unlike that imperfect human that you quickly moved on from, this restaurant has only gotten better with age. The menu is now full of hits that you can come back to every time, while maintaining enough variety to keep things interesting. It’s both inventive and accessible, adventurous and delicious. So, while there will always be a special place in our hearts for Contra, we’ll save that for the more special nights out. Wildair is our new everyday restaurant, and we’re glad we spent some time waiting for it to get a little closer to perfect. This is basically sushi + bruschetta, and whoever created that equation deserves a large building at a prestigious university named after them. Another must order from the Wildair menu. The beef is rich and meaty, and the smoked cheddar in the mix takes it over the top. One of the most popular dishes on the Wildair menu, and one that we’re not crazy about. The super crunchy batter is just way too salty, and that’s coming from someone who eats Maldon flakes from the box. The inky aioli on the side is cool to look at, but doesn’t add much. Order it if you’re curious, just know that two bites is all you’re gonna be able to handle. What’s that? You thought a bowl of salad was on its way out to you? You thought wrong. Here’s a piece of lettuce that looks like an ear of corn. Eat it, and be prepared to be mad about how much you like it. There is usually a rotating crudo dish on the Wildair menu. It changes with the season, but luckily, you haven’t changed a bit, and you’re always down for some raw fish. In this iteration, all those pretty radishes are hiding the diced up fluke, pineapple, and ’nduja sausage. So good. Whatever you do, do not leave Wildair (or Contra for that matter) without eating dessert. Whatever these dudes figured out about putting pudding and frozen fruit shavings in the same cup should be turned into a single concept restaurant chain, backed by all of my money and personal possessions. Every time we’ve been to either restaurant, there’s been some version of this custard and granita on the menu, and every time it’s been incredible.